Julia Child was born Julia McWillams in Pasadena, California, on August 15, 1912, one of John and Julia McWilliams's three children. The children were raised in comfort: they were all sent to private schools, and the family had servants, including a cook. The children, all of whom were unusually tall, loved outdoor sports. In 1930 Julia went to Smith College in Massachusetts, where she majored in history. After graduation she took a job as a copywriter for a furniture company in New York City and enjoyed an active social life. At the outbreak of World War II (1939–45) Julia joined the Office of Strategic Services, hoping to work as a spy. She was eventually sent abroad, but she worked as a file clerk, slept on cots, and wore an army uniform. While in Ceylon (now Sri Lanka) in 1943 she met Paul Cushing Child, a member of a distinguished Boston family, who was working as a maker of maps. Their romance bloomed when both were assigned to China. It was there that Paul, a noted lover of fine food, introduced her to cooking. After the war Julia began to study cooking in Beverly Hills, California. She and Paul were married in September 1946 and moved to Washington, D.C., where he had taken a position with the Foreign Service. After he was sent to Paris, France, in 1948, Julia came to appreciate French food. She decided she wanted to learn about French cooking and, after studying the language, she enrolled at the famous Cordon Bleu cooking school. With two fellow students, Simone Beck and Louisette Bertholle, she formed a cooking school called L'Ecole des Trois Gourmandes (School of the Three Gourmets). Julia began working on a cookbook with Simone Beck, writing while following her husband as he was sent to different parts of Europe. In 1961 Paul retired, and the Childs settled in a large house with a well-equipped kitchen in Cambridge, Massachusetts. Julia's book, Mastering the Art of French Cooking, was published the same year. With its clear instructions and explanations and its many useful photographs, it was an immediate success. Child was hailed as an expert, and she began writing articles on cooking for magazines and newspapers. In 1963, after appearing on a television panel show, Child began a weekly half-hour cooking program, The French Chef. This proved even more successful than her book: her off-beat style, good humor, knowledge, and flair for teaching made her very popular. Her work was recognized with a Peabody Award in 1965 and an Emmy Award in 1966. The French Chef Cookbook, based on the television series, was published in 1968. More well-received cookbooks and television shows followed, and in the 1970s and 1980s Child wrote regular columns for magazines and made many appearances on television in addition to hosting her own show. She was also a founder of the American Institute of Wine and Food, an association of restaurants dedicated to increasing knowledge of food and wine. In 1989 Child's husband suffered a stroke and was moved to a nursing home. She coped with her loneliness by exercising, writing, doing public speaking, and working on television programs. She even provided a cartoon voice for a children's video. In August 1992 170 guests paid $100 or more to attend her eightieth birthday party (proceeds went to the American Institute of Wine and Food). She became the first woman elected to the Culinary Institute Hall of Fame in October 1993. In 1994 Paul Child died. Although saddened by his death, she brought out a new book and television series combination in each of the next two years. She also continued to host an annual trip to Italy for food lovers. In 2000 Child won the Legion d'Honneur, France's highest honor. In 2001 she moved to Montecito, California, and oversaw the opening of a restaurant named after her, Julia's Kitchen in Napa, California. In 2002 she donated the kitchen from her Cambridge home to the Smithsonian Institution, where it will be restored as an exhibit at the National Museum of American History. 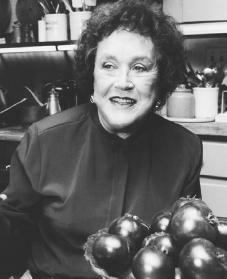 Although a strong supporter of classic French cooking, Julia Child changed her approach during her career to reflect modern needs and trends, such as cooking with less fat and red meat and focusing on meals that can be prepared quickly. Above all, she tries to increase the public's awareness and appreciation of wholesome, well-prepared food. Coffey, Roberta Wallace. "Julia and Paul Child." McCalls (October 1988). Fitch, Noel Riley. Appetite for Life: The Biography of Julia Child. New York: Doubleday, 1997. Jaynes, Gregory. "A Holiday Bird and a Free-Range Chat with Julia." Life (December 1989). Snodgrass, Mary Ellen. Late Achievers: Famous People Who Succeeded Late in Life. Englewood, CO: Libraries Unlimited, 1992. This was delightful, straight forward and useful. I am wondering since Julia was American through and through, where did she come up with the strange British accent? My family is from Montecito. Julia died in Cottage Hospital right next to my mother. I ALSO WAS WONDERING ABOUT HER ACCENT AND IF SHE HAD ANY CHILDREN? I was also wondering if she had any children, I saw the movie by Nora Ephron, " Julie & Jolia", and it gave little hints that she didn't, but I want to know for sure. Great biography! why Montecito? (did she choose as location for assisted living at the end? why not Boston? (where beloved husband Paul lived his last years in a home? Why couldn't she conceive? Since she wanted a child, why didnt they adopt? fact checking, anyone? There aren't photographs in Mastering the Art of French Cooking! There are some line-drawing illustrations of some things like finished dishes, ingredients and various cooking tools... This website is presented as an encyclopedia, please try to present facts instead of fiction!